We love bringing in elements of the season with this silver dish that sits on a shelf in our kitchen. In the spring and summer it holds sea shells we’ve collected from various beaches, and in the fall we fill it with pinecones. 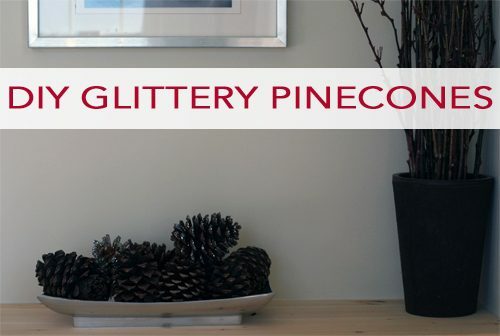 Although pinecones are beautiful just as they are, you can also dress them up with a little bit of glue and a little bit of glitter to capture some of that Christmas magic! Use your paint brush to dab a layer of glue on the tips of your pinecone, covering a quarter of the pinecone at a time. 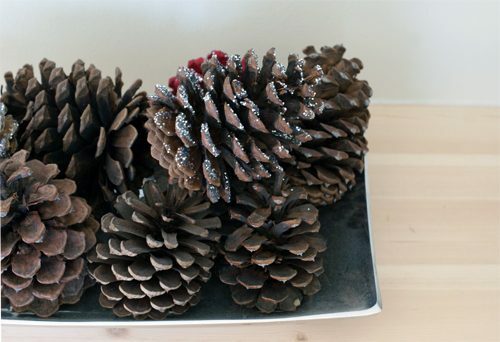 Holding the pinecone over a mat or tray, sprinkle the glue with glitter. Repeat until all of the tips have been glittered and then set aside to dry.